A member or non–member just has to click a link and give to any of your causes, any time of day, anywhere. 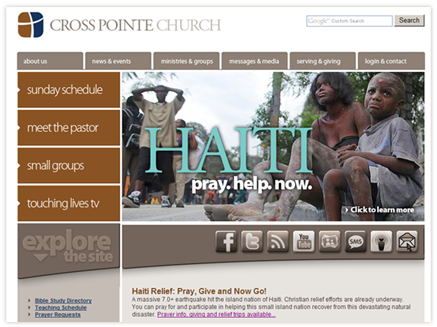 This makes it more convenient than ever for people to give at your church. 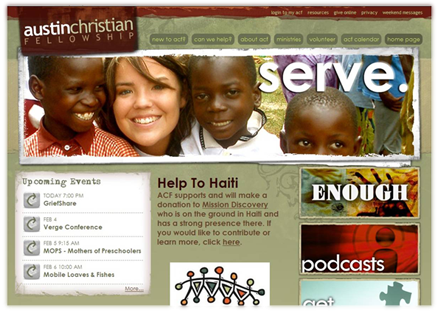 Online giving is much faster than writing a check, putting it in an envelope, and mailing or bringing it to church. Plus, giving online allows the user to choose if they want to give a one-time gift, set up recurring gifts, or make event payments. They can also decide which payment method works best for their personal situation. Another time people can give is in times of crisis. Whether it's a natural disaster like the earthquakes in Haiti and Chile or a crisis in your own community, people have only to log on to your Web site and enter their contribution amount to participate. Being able to immediately respond to situations like these provide a sense of connection – users feel like they are able to make a difference in someone else's time of need without delay. Northwoods Community Church in Peoria, IL, had their Haiti relief fund up and running in minutes, and raised thousands of dollars in the weeks following the disaster. Being able to give even when not physically in attendance at the church is another major reason for the popularity of online giving. Think about how this would improve the consistency of giving in your church during the 'summer slump' months. Whether people go on vacation, get sick, need to travel, or don't live in town, they can easily set up recurring gifts and keep their giving on track. "Our members love the fact that they can give how and when they want with no hassles – on vacation, in the middle of the night, on a recurring basis, or making one contribution at the end of the year. No matter how they choose to give, Online Giving within Access ACS makes it easy to accomplish"